Katherine Elizabeth began her career in millinery under the talented eye of Stephen Jones, creating pieces for the Dior runway shows and the John Galliano boutique in Paris. After working with Catherine Delaney in theatre and film, Katherine set up her own Millinery House which is based in Clerkenwell, London. Katherine Elizabeth Millinery is an award winning millinery house whose achievements include the Walpole Crafted scheme, Lff Profile Awards and Dzina Fashion Awards. In 2012 Katherine won the London Lifestyle Award for Best Fashion Retailer, being voted the winner out of over a thousand retailers! Katherine exhibited at Fortnum & Mason during London Craft week this year 2015, Katherine is also a Member of the Walpole British Luxury group. 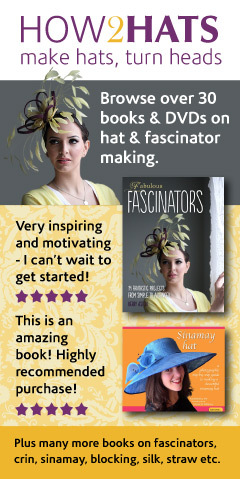 Katherine has also appeared on the BBC coverage of Royal Ascot where she was tasked with making a hat live on air! Whether it’s Royal Ascot, Henley Royal Regatta, a wedding, garden party, or you simply need a glamorous headpiece; they are home to beautiful hand-made millinery. 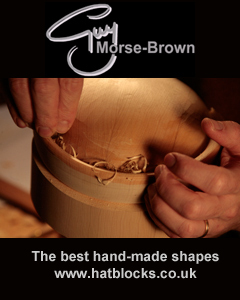 If you wish to buy, hire or even create your own hat at a Millinery House event, its all there. As well as making hats for her clients, hosting talks and corporate events, Katherine also teaches millinery masterclasses. Royal Ascot Racing Hat Weekend! In this weekend class you will learn how create a special sculptural Ascot hat by blocking, wiring, edging and trimming the piece with feathers, sinamay, beads, fabric etc. All Fabrics provided as well as tea and cake! In this class you will expand your millinery knowledge by learning how to block a bespoke headpiece on our wooden millinery blocks. You will then cut, wire and edge the headpiece using age-old techniques. Katherine herself will explain and demonstrate the steps and practice of making a headpiece. Katherine will teach you the basics of setting up a small creative business including the core principles of PR, branding, digital marketing and social media that have been central to her strategy over the last five years. 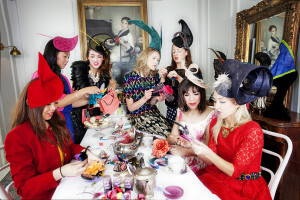 In this class you will learn how to create a beautiful Royal Ascot worthy headpiece using sinamay bases; we will teach you how to cover in fabric, cut and manipulate feathers, use netting, ribbons, and beading. Saturday Day class in a Creative Millinery Workshop. One-on-one lessons are perfect as one embarks on a creative journey under the expert guidance of Katherine, to learn, explore and expand on everything about millinery. Please email cloe@katherineelizabethhats.com if you need further details.